Responsible gun owners know the importance of buying a high-quality gun safe to keep their weapons safe in their homes. After all, there are about 393 million guns in the US and statistically, most gun accidents happen in the home. The best thing you can do is protect your loved ones and yourself by making sure the guns and ammunition in your home are safe and sound. However, most gun safes are extremely expensive, which makes protecting your firearms, friends and family cost prohibitive. Maybe you’ve looked into safes before or are looking to grab a second one. When it comes to picking out your best gun safe for under $500, some key features come to mind. You’ll want your safe to be made from heavy-duty, high-strength steel, offer you high-tech security measures and have enough room to store all of your weapons and ammunition. If you value security, many of the safes on this list are easy to hide away in any space you’re in. That gives you peace of mind knowing that criminals and small children won’t have access to your weapons. Responsible gun owners everywhere have opted to get gun safes to protect themselves, the public and their loved ones from those with bad intentions. Now, it’s your turn. 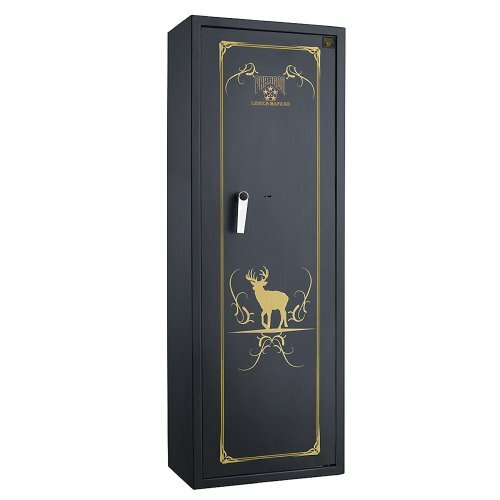 This list is going to be a comprehensive guide to getting yourself a quality gun safe for under $500. Here we go! Do You Store Ammo with Guns in the Safe? 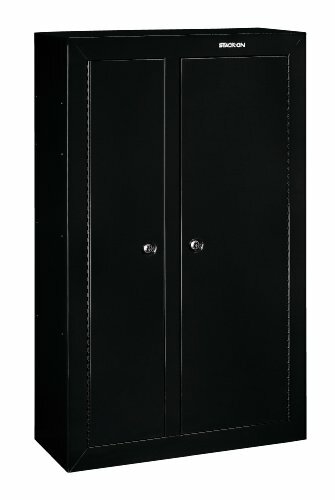 The Stack-On Tactical Cabinet is a top-of-the-line safe, designed with gun enthusiasts in mind. In fact, this gun safe is so top-notch for gun owners it’s even approved by the California Department of Justice standards in Safely storing firearms. 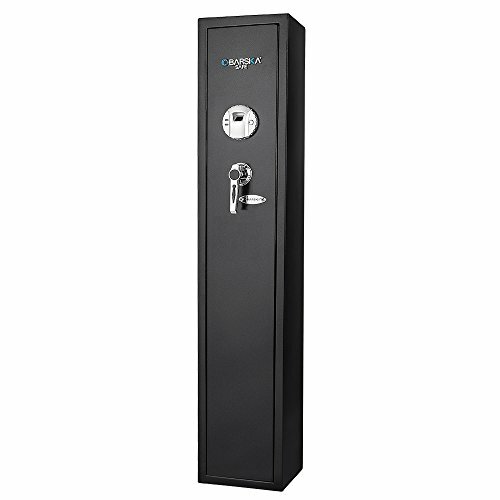 It’s made of high-strength welded steel, making it one of the most secure safes on the market. The Stack-On GCDB is big enough to accommodate up to ten rifles or shotguns up to 54 inches in length, with a foam padding bottom to prevent scratching up your guns. Stack-On’s patented barrel rests make absolutely sure that your guns will be kept in place, molding to the shape of the particular gun they’re holding. They’ll never decompose or deteriorate over time, ensuring long-term stability and security for your firearms. That special design keeps your scoped rifles upright and towards the from of the safe, allowing for one position storage. The reinforced steel door features a state-of-the-art three-point locking system along with a key code and double-bitted locking mechanism. When it comes to security, there are not many better options than the Stack-On GCDB. The safe also features a built-in valuables cabinet, which can only be unlocked by a separate key. That drawer is perfect for storing valuables you might not want to leave out in the open, like a passport, social security cards or other sensitive documents. You could even store valuable jewelry or family heirlooms. The interior four padded shelves are great for storing ammunition, smaller guns like revolvers or pistols and smaller valuable objects. There’s room in this safe for everything you’d ever need safe and secure in your home. Weighing in at 166 pounds and just over 55 inches tall, this isn’t a safe you’ll need to worry about being carried away in the event of a break-in. If that doesn’t convince you, the pre-drilled mounting holes will let you easily attach this safe to any wall or surface it might be up against. If you’re not yet convinced the Stack-On GCDB is the right gun safe for you, it comes with a limited one-year that covers any warps, defects or workmanship issues you might come across. One of the more expensive safes on this list, you’re paying a premium for quality. The Stack-On specific barrel rests, padded shelves and super advanced door locking mechanism makes sure anything you put in this safe is secure and protected. The welded, stacked steel door hinge is durable and the locking plate behind the door is an added layer of security and protection. This safe is over a hundred pounds, able to be anchored in your home and made from hardened, high-strength steel. The only way this safe is going to open is if you want it to, keeping your home and family as safe as possible. When it comes to a safe for your firearms, few can top the 7550 Paragon. This safe has plenty of space for your weapons, with room for up to eight rifles, some handguns and ammunition. It’s the perfect place to store your entire arsenal. With gray mat carpeting along the bottom of the safe and Gauge powder coated interior and exterior, this safe knows what it takes to protect anything you put into it. This is a safe that gives you a lot of room to work with, including a massive 19-inch deep interior chamber, giving you nearly five and a half cubic feet of storage space for your guns. With all that space, you can store guns as long as 47 inches long. The rock-hard steel body is made from 18 gauge solid steel, making attacks, either by hand or with mechanical tools, useless. The tamper-proof, concealed hinges add to the security, letting you rest easy knowing your things are secure no matter what. The simple but effective exterior door lock can be opened with just a simple set of keys. Weighing in at just over 110 pounds, this safe is a sturdy, reliable option for any home. It even comes with pre-drilled holes on the inside of the safe for anchoring to any wall or surface, which is essential because if the safe opened without being properly mounted, it might tip over due to the weight of the door. A major plus for this safe is its low price point as well. The second cheapest entry on this list, this safe is a great option if you’re working with a smaller budget or looking for a bargain. The solid construction, safety features and innovative design are fantastic. There’s also an incredible, full 10-year warranty, meaning anything that goes wrong with your safe would be covered, replaced and repaired. If you’re looking for security, simplicity and value, you should heavily consider picking up the 7550 Paragon. It’s 18 gauge steel exterior, hidden hinges and simple key-operated lock are all fantastic features in the safe industry. With its low price point, this gun safe is a major factor for those on a budget or looking to spend as little as possible for a high-quality safe. If you’re looking for a high-tech safe for an incredibly low price, the Barska Quick Access Rifle safe is the right fit for you. This model’s advanced biometric technology is a high-tech solution to keeping your weapons out of the wrong hands. Capable of storing up to 120 individual fingerprints, it’s super easy to open for those you want to have access and locked up tight for those you don’t. Built to allow you to access your weapons when you need them most, the lightning-quick biometric fingerprint scan takes only 2.5 seconds before you can get your hands on your weapons and ammunition. If for whatever reason you’re worried about the fingerprint scanner, have no fear. You can unlock the safe with a pair of back-up keys in a hidden keyhole, giving you access to your weapons when you need them most. You can even plug in an additional external battery pack for when the batteries are running low, keeping the biometric tech up and running for when it’s needed. You’ll always know when your batteries are running low due to a warning tone the safe emit when power is low, letting you know when it’s time to change the four AA batteries it requires. For those with stealth in mind, the warning tone can easily be silenced with just the press of a button. This small and compact safe, only 52.2 x 9.8 x 8.7 inches and only 65 pounds, is a great fit for apartments, small homes or those looking for a safe they can store easily. It can easily accommodate up to four rifles and is a fantastic option for protecting your handguns and ammunition. Despite its small size, the Barska Quick Access Rifle safe is built from solid steel, features three steel deadbolts and edge protection to prevent tampering. Those protective edges make prying the safe open impossible and the three deadbolt design ensures your weapons are protected no matter what. The lowest priced entry on this list, this safe is a compact, affordable option for those on a budget. Despite its small size, this safe is a great option for many. It’s compact size, high-tech security integration and sturdy steel design make the Barska Quick Access Rifle safe a fantastic, affordable option for those with safety in mind while working on a budget. If you’re on the hunt for a safe that even the FBI approve of, look no further than the Verifi Smart Safe with FBI Fingerprint Safe. The second gun safe on this list to give you and your family fingerprint access, this safe is simple and effective. When you don’t have time to search for keys and fumble around with a lock, this fingerprint design allows for quick and easy access when you and your family need it most. The certified FBI-certified fingerprint sensor offers built-in 3D imaging, unlike some other safes with cheap, unreliable sensors. You can add up to 40 individual fingerprints, easily delete users, and check its access log, which gives you a comprehensive timeline anyone who accessed the safe. No need for a weak and often-forgotten access code to protect your firearms, the fast access fingerprint scanner give you quicker access when you need it most. Packed with other features like AutoLock, NiteLite, Tamper Alerts, an LCD display, stealth mode and SelfCheck, this safe is loaded with tech. The safe also features Zvetco Biometric technology, a system used by government agencies around the world. The U.S. Department of Homeland Security and State Department, for example, are just a few of the agencies to utilize this technology. A compact, steel construction design lets you easily store and hide this safe away from children. Reliability is a key feature for the Verifi Smart Safe with FBI Fingerprint Safe, capable of running for years off of just 4 AA batteries. For those with young children or nosy roommates, you can set tamper alerts that will log and notify or alert you when people fail to get into the safe. For another added layer of security, the Verifi Smart Safe has an AutoLock feature, locking and securing your safe automatically every time the door is closed. Most safes make you manually lock up after use, putting those in the house at risk if it ever were to slip your mind. Along with that, the Nite-Lite feature lights up the inside of the safe so you can see what’s inside even in the darkest room. You can adjust those light settings to fit your needs, even opting to turn it off if you’re really into stealth. The Verifi Smart Safe is a fantastic option for those who take their stealth, security and peace of mind seriously. The smallest, most compact safe on this list, this is a great option for those in apartments or those who are looking to hide away their weapons. With its various security options, like its AutoLock, NiteLite, Tamper Alerts, an LCD display, stealth mode, SelfCheck and top-of-the-line FBI fingerprint verification, the only ones getting into your safe and getting a hold of your weapons are those you allow to. Well under the $500 price range for this list, the Verifi Smart Safe with FBI Fingerprint Safe is a great option for those with security at the front of their minds. The final entry on this list is the Snapsafe Under Bed Safe, a great option for those looking to keep their weapons close by in the night. This safe fits neatly under any bed, letting you grab your weapons and check out any strange noises you might hear in the late hours. This safe is constructed from heavy-duty 14 gauge steel with a pry-resistant door to keep intruders or children from getting access to your weapons and ammunition. The safe even features built-in, pre-drilled holes for permanent anchoring and a three-foot long cable for anchoring to stationary, heavy nearby objects. The massive slide-out drawer has plenty of space for your weapons and ammunition, even for jewelry, family heirlooms and important documents. This safe has a ton of mobility options as well. It easily fits under most furniture, giving you access to your weapons in any room you need them. The Snapsafe can even be used in vehicles for protection and security anywhere you’ll go. Another safe on this list that uses tech to stay on the edge of security innovation, this safe features digital door access alongside the manual entry features. You can easily program in anywhere between a 3 to 8 digit access code, allowing only the people with the right codes to open your safe. If you’re not into digital access, this safe can easily be popped open with a key. At 130 pounds, this safe won’t be going anywhere in the event of a break in, giving you peace of mind for your weapons if you’re dealing with a home invasion situation. The deep drawer has plenty of room for up to seven guns, along with important documents and jewelry you want to keep locked up and secure. One of the more expensive entries on this list, it’s worth the value for its mobility and ability to fit under furniture for hidden security. This under bed safe is a fantastic option for those looking to keep their weapons close in case of an emergency. 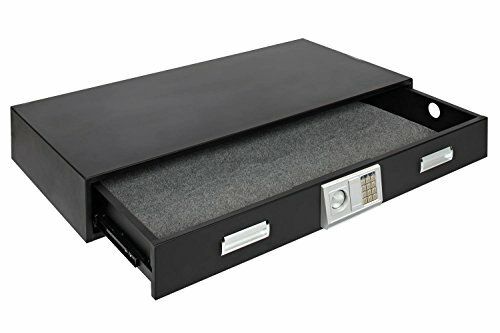 This safe easily fits under most furniture, gives you digital and manual options to get into the safe at a moments notice, and can be loaded up into your vehicle to take your valuables and keep them protected when on the move. Made of high-grade steel and featuring a pry-proof door, the only way this safe is going to open is if you want it to. The Snapsafe Under Bed Safe is a great value for the price point, and also provides everything you need to keep your collection secure and family safe. Unfortunately, most gun safes aren’t waterproof. In the case of a flood or any other type of water-based disaster, your weapons likely wouldn’t be protected. There are products you can buy to waterproof your home and gun safe, but that doesn’t come as a key feature for most gun safes. Yes, storing ammunition in your gun safe is a great option for security and keeping your rounds safe. Putting your loose rounds in an airtight ammo can inside the safe is a great way to keep those rounds safe and functional. Uncovered and unprotected ammo can be susceptible to humidity and moisture, which damages and rusts the bullet casing over time. That will ruin the round, making it unfireable. On top of preventing moisture build-up, locking up your guns is a great way to make sure they don’t fall into the wrong hands. Locking up your guns and ammunition is the best way to keep your guns and ammo out of the hands of young children or those who mean to do you harm. Guns left out in the home are a major cause of accidents in the home, so locking up and securing your weapons is the best way to go. When it comes to locking up your weapons and ammunition to protect your family, any of the options on this list would be right for you. All of the safes on this list are made of heavy-duty material, have unmatched and high-tech security features to keep anything you put into it safe and custom settings that allow users to get exactly what they need out of their safe. This list was put together because not everyone has thousands of dollars to drop on a gun safe. No matter what you budget it, the safety and security of your family is priceless. The safes on this list are of the highest quality one could get for under $500, making sure your guns and ammunition are locked up tight and ready for any situation.